A black and white portrait photograph of James Ironside Davidson, 1818-1902. James Ironside Davidson was born at Monquhitter, Aberdeenshire, Scotland, on June 8, 1818, settled on Lot 1, Concession 8, Pickering Township, near the village of Balsam, in 1842. He began breeding Clydesdale horses and Shorthorn cattle in 1859. In 1871 he began importing animals from the famous breeder, Amos Cruickshank, of Sittyton, Aberdeenshire, Scotland. He named his farm "Sittyton Grove" after Cruickshank's home and was one of the prime breeders of Cruickshank cattle in North America. He imported 185 cattle from the Cruickshank herd. He served as Federal Member of Parliament for Ontario South as a Liberal in 1891-92. His daughter, Mary Ironside Davidson, married William M. Miller and was the mother of Margaret Miller the future wife of William Arthur Dryden. 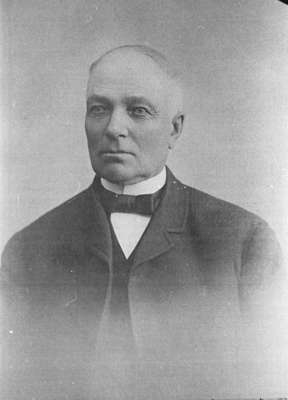 Mr. Davidson died at the age of 83,at his home in Pickering Township, on February 15, 1902, and is buried at Burns' Presbyterian Cemetery, Ashburn.